We’d love your help. Let us know what’s wrong with this preview of Belonging by Umi Sinha. To ask other readers questions about Belonging, please sign up. Anyone come across any other novels featuring the Siege of Cawnpore? I feel sure I've read one but can't remember. I have never read a novel twice in a row before – finished it, then turned back to page one and started again. I did that with Belonging because it was so beautifully, intricately crafted, so layered and nuanced, that I knew I would love it as much, and see even more in it, the second time round. This is not to say that I didn’t have to make an effort, for a few chapters, to get the relationships clear in my head – Cecily is Henry’s mother, Henry is Lila’s father. Each life from a different gener I have never read a novel twice in a row before – finished it, then turned back to page one and started again. I did that with Belonging because it was so beautifully, intricately crafted, so layered and nuanced, that I knew I would love it as much, and see even more in it, the second time round. This is not to say that I didn’t have to make an effort, for a few chapters, to get the relationships clear in my head – Cecily is Henry’s mother, Henry is Lila’s father. Each life from a different generation unfolds concurrently, glimpses of past, present and future creating a strangely timeless perspective. It’s an unusual structure. But any effort I made to get my head around it was repaid many times over in the poignancy of knowing all the characters deeply – grandmother, father and daughter – and some of the crucial events of their lives (and deaths) even before they did. And what I didn’t know tantalised me throughout – I found myself hungry for secrets to be disclosed, completely gripped. I liked and cared about the characters – Cecily, naïve but surprisingly fair-minded, who many times tells the truth of things. Poor Henry, perplexed and guilty, oppressed by the mystery of his mother’s death. Lila, uprooted, bereft, a little girl who somehow contains both sides of history, who is fiercely intelligent, deliberately mute. Their lives weave and press against one other, each perspective revealing a little more of the other’s story. Belonging brings an important history alive, makes it vivid, real and unbearable (so much so that I had to remind myself on several occasions that Umi Sinha wasn’t actually there, making the journey from England to India via Cairo, for example, in 1855). The idea of belonging – and not – travels from beginning to end, almost as tangible as the objects that travel with Lila: a Sussex stone with a hole in it and a statue of Shiva dancing in a ring of fire. This is a wonderful novel, ambitious and entirely successful. And a significant story, beautifully told. This really is an important novel. I don't often review books, and in this case feel almost presumptuous doing so - because this isn't just another book. I'm not going to summarise the plot - because, given the way the novel unfolds, this would inevitably provide "spoilers". The novel addresses issues that are part of the construct of our current attitudes and assumptions. Racism, abuse, war, the construction of identity; it's all there, being examined by Umi Sinha in a way that is obviously deepl This really is an important novel. I don't often review books, and in this case feel almost presumptuous doing so - because this isn't just another book. The novel addresses issues that are part of the construct of our current attitudes and assumptions. Racism, abuse, war, the construction of identity; it's all there, being examined by Umi Sinha in a way that is obviously deeply felt. Her depth of feeling for the characters and the historical circumstances of the plot - for the distorted relationship between India and England - is clear, and I think that personal identification is what gives Sinha's writing its power. The novel has three narrators, from three different, but successive, generations. These narrations are interspersed. This sounds like it could lead to confusion; but it doesn't. That really is a tribute to the clarity of the writing. This clarity makes a book, which is difficult in terms of the issues it tackles, easy to read. A very serious book which is also a page turner - good combination. Contar histórias é uma arte e Umi Sinha conseguiu fazê-lo muito bem. Senti-me cativada desde as primeiras páginas, completamente envolvida pela narrativa e pelas personalidade tão diferentes (e tão parecidas) das personagens principais (Cecily, Henry e Lila). Por fim, tenho de dizer que gosto mais do título original - Belonging - e da capa original. An insightful story set in the second half of the 19th century through and beyond the First World War. I knew in smatterings the course of Anglo-Indian relationships during the era of the Raj, but this book transports the reader through some very troubled times, without it being a didactic experience. Knowledge and information are disseminated as the story of three generations of one family begin to unfurl. It was in 1857 that the Crown took over, a sea-change began and gradually India almost began to morph into an outpost of suburban England. A vast country that was beginning to assert its own power, horns were beginning to lock. Set against this explosive background, the seething discontent, colour and human frailties, the book evokes a country and its people as they transition from one epoch to another. At the beginning of the book there is a family tree, which is helpful just to keep in mind who is related to whom. The story develops through the voices of grandmother Cecily, son Henry and granddaughter Lila and it takes a little while to get into the rhythm, voices and different periods. The background of the broader history that is playing out reverberates into the lives of the individuals and their families in often unexpected ways. Death stalks their lives, and mental health issues take their toll. Characters from a variety of ethnic origins and backgrounds are thrown together to in this combustible storyline, interspersed with perceptive research that brings the various periods to vibrant life. How the interiors of the buildings might have felt, how it took three months to travel 900 miles and how violence at The Siege at Cawnpore rippled down through the generations with devastating consequences. India is contrasted with very different life in Sussex where the strands from that faraway land come to settle. It is here that Lila makes her home with Aunt Mina and wades through the trauma of World War 1, but India – whether memories or the ever present Indian soldiers who fought for the British – is ever present. The author has very well placed the story from the darkest days of the British Raj through to the aftermath of the First World War by showing us the world from the eyes of three different characters of three different generation which is unique and really interesting. She has managed to put the story of three generations and their struggles to understand and free themselves from a troubled history steeped in colonial violence and issues which India had under British Raj. Absolutely wonderful and The author has very well placed the story from the darkest days of the British Raj through to the aftermath of the First World War by showing us the world from the eyes of three different characters of three different generation which is unique and really interesting. She has managed to put the story of three generations and their struggles to understand and free themselves from a troubled history steeped in colonial violence and issues which India had under British Raj. Absolutely wonderful and heart wrenching at times which keeps one glued right till the end... it is serene and disturbing and tugs at our heartstrings in a very special way.. must read for sure. Belonging is a novel that is quietly wonderful. I didn’t have big expectations to begin with, but it’s brilliance slowly crept up on me until I realised that I couldn’t put it down. I don’t want to say too much as I think the blurb says enough - but just read it. Read it. It’s utterly brilliant. Probably one of the most undiscovered and underrated books from the past year. I would never have discovered it myself, but for a completely unplanned (impulsive) trip to the local bookstore where I made a very poor choice and was back to exchange it for something better. And this time too, with the bookshop owner waiting to close shop, I almost randomly picked up 'Belonging'. The cover was beautiful, but the author and book were completely unheard of, and a quick check on GR told me that with a Probably one of the most undiscovered and underrated books from the past year. I would never have discovered it myself, but for a completely unplanned (impulsive) trip to the local bookstore where I made a very poor choice and was back to exchange it for something better. And this time too, with the bookshop owner waiting to close shop, I almost randomly picked up 'Belonging'. The cover was beautiful, but the author and book were completely unheard of, and a quick check on GR told me that with a 4+ rating it was a safe buy. But I was not prepared for this book to be as fantastic as it was! Why hasn't it showed up on any lists!? And I am surprised that even the Guardian hasn't done a review on it, when it seems to review every new book that comes out! - - especially since this one has such a contextual British-Indian theme. I seldom describe a book as "well crafted". Many are well written but this one has something beautiful and intricate about it, much like the fine embroidery that adorns its cover and is a pivotal part of the story. As a debut author, Umi Sinha has set the bar very high and admirably demonstrates, by example, her background as a creative writing mentor and manuscript appraiser. There is something about epistolary novels and I loved this one even more because nearly two-thirds of it is written in the form of letters and diary entries - making the reader so much more involved and engaged with characters and their deepest emotions. Sinha treats her characters with a lot of compassion and sensitivity and one comes away understanding each one - why they became who they were, what shaped their lives. This is my favourite book of 2015. I was lucky enough to get an advance copy and have just finished reading it. I don't want to say too much about the plot, as I'd hate to deprive other readers of the pleasure of discovery. The story unfolds through three different strands and each of the narrative voices is engaging and distinctive. The characters were well-rounded and three-dimensional and the plotting rich, bold and complex. The final chapters are almost unbearable to read, as the final traged This is my favourite book of 2015. I was lucky enough to get an advance copy and have just finished reading it. I don't want to say too much about the plot, as I'd hate to deprive other readers of the pleasure of discovery. The story unfolds through three different strands and each of the narrative voices is engaging and distinctive. The characters were well-rounded and three-dimensional and the plotting rich, bold and complex. The final chapters are almost unbearable to read, as the final tragedy is revealed. A beautifully written, partly epistolary novel about how secrets perpetuate a cycle of loss and a search for belonging that travels down three generations of one family. Events unfold through the letters of Cecily to her sister Mina, the diaries of Cecily's son Henry, and the third-person perspective of Henry's daughter Lila. Set against the backdrop of real-life conflict between India and Great Britain, Sinha uses her elegantly written story to show how concealing the truth does more damage than A beautifully written, partly epistolary novel about how secrets perpetuate a cycle of loss and a search for belonging that travels down three generations of one family. Events unfold through the letters of Cecily to her sister Mina, the diaries of Cecily's son Henry, and the third-person perspective of Henry's daughter Lila. Set against the backdrop of real-life conflict between India and Great Britain, Sinha uses her elegantly written story to show how concealing the truth does more damage than hearing it. Lila and Henry spend much of the novel in the dark about their mothers' stories, leaving them isolated and unable to make connections. As we see through Jagjit's story, the real life concealment of the mistreatment of Indian soldiers in World War I, does much the same. I couldn't help but see how this one part of history feeds in to the situation we find ourselves in now - isolating ourselves against the fear of the 'other', the fear of ourselves being colonised as we have colonised so many others that leads to the ongoing anti-immigration, nationalist rhetoric. I appreciated this novel for opening a window into a part of history I've long felt uncomfortable about - specifically our nostalgic glorifying of this bygone wartime era that conveniently relies on the erasure of non-white and/or non-British soldiers and citizens. This novel draws a beautiful balance between real-life history and emotive storytelling. I felt for all of the characters and their desperate need to find belonging in family and home, but also learned about a part of history I wasn't familiar with (the Indian Mutiny of 1857) and gained a new perspective on a part I wasn't familiar with enough (the Indian participation in World War I). Five stars for an elegant, absorbing and educational read. This was just so slow and the most important action seems to occur off page but saying that historical fiction isn’t my favourite. The jumpy nature of the narrative made it hard to connect to the characters and some of them just weren’t that likeable, also the marrying someone without really knowing them was a bit overdone in this book. Hooking the reader in from the beginning? Belonging certainly does that. I had so many questions about the opening scene in 1907 in Peshawar with Lila aged 12. It isn’t until much later in the story we find out the significance and I spent some time gathering my thoughts to make a whole. I wanted to take away Lila’s pain as she travelled to England. I could feel her grief so sharply. Arriving in a place so totally alien to what she was used to. A sentence misunderstood makes her determined to not say anything and so she chooses to become mute. Umi Sinha has Lila’s social, mental and emotional health spot on for a teen in crisis. A child’s perception and the misunderstandings that follow (because as adults we forget their worldview is very different to ours) is a thread in the story. Often we think children ‘know’ things and don’t share and the child’s subjective thoughts cause them no end of angst. It forms their perceptions of themselves as it does in Belonging with Lila and her father Henry. A lack of positive female role models through the generations is also a theme which impacts heavily on the story. I loved the format of the storytelling. The history of the preceding generations is told by Henry via his journal starting in Bengal in 1868 when he is an 11 year old and letters written by Cecily (Henry’s mum) from the time she’s on-board SS Candia in September 1855 on her way to spend her life with husband to be Arthur. Their stories weave in and out, laying the foundation and building the story. The timelines are not linear, however I wasn’t confused about who, what, where. There is a family tree at the beginning of the book with the narrator’s names highlighted in capitals should it be needed. I have to admit there is one person I misjudged (which I actually felt guilty about!). Emotionally invested in all our key characters meant that I felt a host of emotions – some positive and some negative! Umi Sinha brings the settings in India and Sussex alive. It was so easy to visualise the place and the time. The scenes in Cawnpore and the makeshift Indian hospital during WW1 in the Royal Pavilion, Brighton are etched on my heart. I recommend you visit Umi’s website to find out more about the historical background. The ending is perfect for the overall ambience of the story. I don’t always need a ‘happy ever after’ or a definite conclusion in the stories I read … but I do like to end on hope. would rate it six stars, if I could. historically accurate, gripping yet atmospheric, this is a fantastic debut novel. - The way the question at the beginning of the book answered at the very end. An exercise to my patience! - The ending that reminds me (as a reader) that the characters' lives are not ended when the book ended. They lived just like we are! - Why Lila never seem to miss her mother? Stunning, and even more remarkable as a debut novel. This a compelling story of 3 generations of family set against the backdrop of colonial India, juxtaposed with genteel Sussex in the run up and then the consequences of the first world war. It is in turns a thriller, a study of legacy and identity, a historical social narrative of culture clash and a, ultimately, a story of belonging. Recommended. This is a beautiful book - truly compelling narrative skilfully woven through the generations. Each voice is distinct and engaging and I found it impossible to put aside until I'd finished it. It addresses universal themes of identity, family and home but doesn't duck thorny issues of race, gender and violence. A wholly satisfying read. This is a wonderful book. Beautifully written, gripping and enriching. I was mesmerised by the voices of these characters, the vastness of their experiences. One of those rare books I had to read again. This is powerful storytelling. Beyond the Raj – the Search for Identity in an Anglo-Indian World. Longing to be; the longing, the yearning to become part of a definite place in time and knowing for certain that that is where you belong. 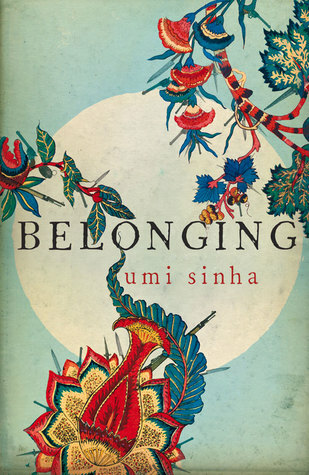 Such a simple yet overwhelming desire is the essence of Umi Sinha’s first novel, Belonging, published by Myriad Editions, UK. And how elusive the search proves for this dynasty of Anglo-Indians caught between two cultures and belonging to neither. It is a breathtakingly complex book covering th Beyond the Raj – the Search for Identity in an Anglo-Indian World. Longing to be; the longing, the yearning to become part of a definite place in time and knowing for certain that that is where you belong. Such a simple yet overwhelming desire is the essence of Umi Sinha’s first novel, Belonging, published by Myriad Editions, UK. And how elusive the search proves for this dynasty of Anglo-Indians caught between two cultures and belonging to neither. It is a breathtakingly complex book covering the intense journeyings of daughter, father and grandmother as they search back and forth, through the media of letter, diary, memoir, history and conversation, desperately trying to find each other, people they barely knew, and in the process, themselves. What defines an Anglo-Indian? Who are they and where in the scheme of culture and education, ruler and servant, home and abroad, do they actually belong? Umi Sinha, herself born and raised in Mumbai had an English mother and Hindu father, the first a writer and the second a highly-educated naval officer. She was later educated in England, where she lives, but surely her heart and soul are in India. Her unusual background provides her with a profound understanding of the intricacies of Anglo-Indian culture and society from the Raj through to the First World War. She intersperses the horrors of the Cawnpore Massacre (1857) with an appalling vision of the trenches in France and the cruelty of Mesopotamia – where a million Indian soldiers died alongside the British but have never been acknowledged. Her meticulous research into every detail of the eras she covers makes for a fascinating read. The author of Belonging has achieved admirably what many don’t even attempt, with her seamless changing of voice from a young girl to a small boy and a newly-wed woman. All are transformed with time and experience and other voices are successfully introduced as their stories unfold. Sinha convinces her reader of multiple settings: glittering dinner parties and class/caste distinctions during the Raj; the extreme heat of the Indian plains and the dreary wetness of an English winter; the battleground and final days of Cawnpore and the killing mud of Ypres. But more compelling are the internal landscapes and conflicts of the central characters as their own searches reveal their places of belonging within the worlds they thought they knew. I love a book that I can’t put down. From the puzzling and shocking opening I have to read on and find out what lies behind it. Only towards the end is the rationale for all these complex struggles and secrets finally resolved. Umi Sinha comes from a distinguished literary family: her brother Indra’s novel, Animal’s People, was short-listed for the 2007 Man Booker Prize. But Belonging is quite a different contribution to the literature and has just been short-listed for the British Author’s Club Best First Novel Award 2016. I received this in a subscription box (Books that Matter, if you’re interested) and I am so glad as it’s not the type of book I’d ever pick up myself. It taught me about a history I’d never even considered in an engaging way, and I loved the inter-generational storytelling - not just for the different perspectives but also for the narrative devices (letters/diaries/prose) each protagonist used. You can tell how much I loved it by how long this review is compared to my usually non-existent reviews I received this in a subscription box (Books that Matter, if you’re interested) and I am so glad as it’s not the type of book I’d ever pick up myself. It taught me about a history I’d never even considered in an engaging way, and I loved the inter-generational storytelling - not just for the different perspectives but also for the narrative devices (letters/diaries/prose) each protagonist used. You can tell how much I loved it by how long this review is compared to my usually non-existent reviews. I was not expecting a lot of this book but it completely surprised me. It was cleverly and beautifully written, evoking the sights and smells of both India during different eras and southern England/Sussex during the early 20th Century. The characters were very likeable, particularly Lila. Enjoyable storyline and would definitely recommend it to others. This has instantly become one of my favourite books of all time. I didn't choose to read this book myself but received it in a subscription box called Books That Matter and I'm so glad I have had the chance to read this. Brilliant writing and so moving on all levels. An interesting tale, told in 3 parts across 3 generations - mother, son, daughter. But I didn’t find any of the characters particularly engaging or likeable so I didn’t find myself caring greatly about them. I think if I had then my overall rating of the book would have been higher. Nicely written though I found the PoV changes a bit tiresome. A good first book, and yes a page turner but I learnt nothing new. A great read full of history with a tale that pulls you in. Wow. Very readable, despite the tough topics. I loved this book. Amazing how she interweaves the stories. Didn't want to put the book down, absolutely incredible! I would never have picked this book out myself but so grateful to have it chosen for me. Absolutely brilliant! Umi Sinha was born in the military hospital in Mumbai (then Bombay) in 1952 to an English mother and Indian father, and grew up in India in the decade following Independence, when there was deeply held resentment against the British. She moved to Britain in 1968 during the backlash against the mass immigration of Asians who had been expelled from Uganda and Kenya. The experience of being an outsid Umi Sinha was born in the military hospital in Mumbai (then Bombay) in 1952 to an English mother and Indian father, and grew up in India in the decade following Independence, when there was deeply held resentment against the British. She moved to Britain in 1968 during the backlash against the mass immigration of Asians who had been expelled from Uganda and Kenya. The experience of being an outsider looking for a place to belong, along with the impact of history – political and personal – on individual lives, is a major theme in her writing.